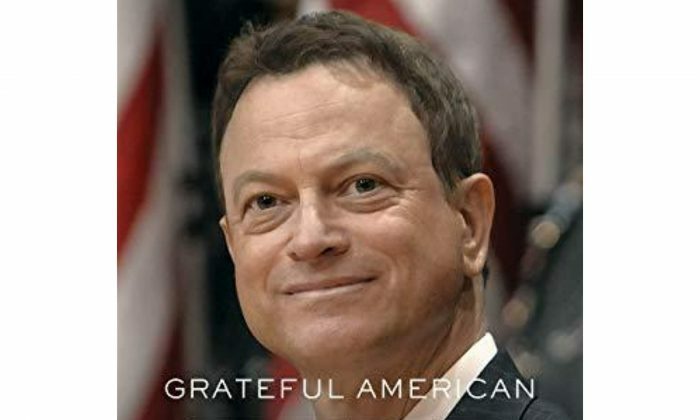 Albert Einstein’s quote, “The true value of a human being is determined primarily by the measure and the sense in which he has attained liberation from the self,” perfectly matches what Gary Sinise’s new autobiography, “Grateful American: A Journey From Self to Service,” describes. Selflessness is often overlooked as a way to achieve happiness in this world because the very idea appears to run contrary to that notion. Yet the reward of doing something for others cannot be replicated, and this idea comes through in this inspiring read. According to its subtitle, Sinise’s book chronicles his “journey from self to service” as outlined in three areas: his work in the entertainment industry, his personal life, and his work in connection with the military community. Raised in suburban Chicago, Sinise switched schools a lot, partied, and was more interested in sports and rock ‘n’ roll than in reading or schoolwork. His life at that point lacked direction. Then one day, opportunity presented itself in the form of Mrs. Barbara Patterson, his high school theater teacher. She asked Sinise and his friends to try out for the spring musical “West Side Story” because, she said, they looked like gang members. Sinise was tempted to shrug this suggestion off, but didn’t, and this decision made all the difference. He became hooked on theater. In 1974, when he was 18, Sinise co-founded the Steppenwolf Theatre with two of his friends, Jeff Perry and Terry Kinney. The theater began in a church basement in Highland Park, Illinois, and over time became one of the most exciting theater companies in America, igniting the founders’ careers along with those of John Malkovich, Joan Allen, Gary Cole, Laurie Metcalf, Dennis Farina, John Mahoney, and many others. Sinise’s book captures the energy of the company creating a theater from nothing, and that of its transfixed audiences who enjoyed sharing a theatrical experience with performers sensitive to their reactions. Then, of course, there was “Forrest Gump.” The so-called simple character of Gump was able to see into the soul of Lieutenant Dan Taylor (Sinise), a veteran, bitter at the loss of his legs and at the way he was treated when he returned from the Vietnam War. Sinise said that this role helped him cross the line from actor to recognized actor, and changed his life in unforeseeable ways. The section on Sinise’s personal life is rather inspiring. Sinise, married to actress and Steppenwolf Theatre member Moira Harris, have two daughters, Sophie and Ella, and a son, McCanna. His youngest daughter faced open-heart surgery but recovered from that ordeal. Sinise’s darkest times came with his wife’s abuse of alcohol. She reached a low point where she needed rehab to stay sober, but since the end of 1997, Harris has not touched alcohol, and their marriage is still going strong. Later Sinise and his family converted to Catholicism, which became a positive force in their lives. It gave him comfort and the strength to meet the challenges of life with faith. It also deepened the course that his life had already taken. Three days after 9/11, on the National Day of Prayer and Remembrance, Sinise took his family to church, where Father Bill talked about service, volunteerism, and supporting each other in times of need. Sinise took those words to heart. Even more inspiring than the challenges of his personal life are Sinise’s contributions to the military. Sinise already had an interest in Vietnam vets before he was cast to play the double amputee Lt. Dan Taylor in “Forrest Gump.” The movie showed that as the Vietnam era ended and more and more wartime atrocities came to light, a national implication of guilt and shame was placed on Vietnam veterans as participants in a brutal, unsuccessful, and very long war. Sinise’s role as Lieutenant Dan, a man angry at the stigma he faces in light of his sacrifice, resonated with the veteran community. Sinise, in turn, realized that the veterans had not received all the honor, respect, and gratitude their sacrifices deserved. He set out, as much as he was able, to right a wrong, and in the process, he created an enduring connection with the military community. Because everyone seemed to know Lieutenant Dan, Sinise found himself in great demand. He started visiting veterans with his music group, the Lieutenant Dan Band, and spoke at organizations such as Disabled American Veterans. The 9/11 disaster galvanized Sinise’s efforts. He did everything he could to help, culminating in the creation of a foundation: the Gary Sinise Foundation. It “serves our nation by honoring our defenders, veterans, first responders, their families, and those in need” through unique programs. The discovery of these wonderful programs makes the book worthwhile in itself. R.I.S.E. (Restoring Independence and Supporting Empowerment) helps adapt or build homes to fit the needs of severely wounded soldiers. A mentoring program introduces some of the younger wounded veterans to veterans from previous wars to help the younger vets cope. Another program supports aging veterans. As of Dec. 21, 2018, the Gary Sinise Foundation received 100 out of 100 rating, as assessed by Charity Navigator. As a symbolic touch, it seems fitting that Sinise’s book will be released on Feb. 12, Lincoln’s Birthday. That great American was also grateful for the efforts of his country’s soldiers. In his Second Inaugural Address, President Lincoln said words that have since been inscribed on metal plaques flanking the entrance to the Washington headquarters of the Department of Veterans Affairs: “To care for him who shall have borne the battle and for his widow, and his orphan.” Gary Sinise’s life has been in keeping with Lincoln’s poignant agenda.